Augsburg 1520 is a game of money management and wealth. Players play as Jakob Fugger, who back in the 16th century became even more rich than the royals. In Augsburg 1520, you get to loan money to the royals and become wealthier and more powerful than them. 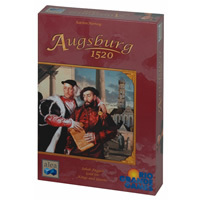 Augsburg 1520 is a strategy based game that will get you thinking. With up to 5 players able to play at a time, this lengthier played board game will definitely help you pass the time with friends and family. Skip back in time and test your skills in a game of Augsburg 1520. To become the Augsburg 1520 champion, you must be able to loan high enough amounts of money to the royals and build up the town in the proper order. Your box of Augsburg 1520 will include a Augsburg 1520 game board, 7 wooden markers, 5 player boards, 90 cards, 4 frames and the official Augsburg 1520 board game rules and instructions. Please keep in mind that the official Augsburg 1520 board game rules and instructions could be different depending on the game version you have. The rules below are some of the exact directions on how to play Augsburg 1520. Share with us your comments, funny stories, tips, advice, strategies, creative ways to play, questions about how to play, problems with the rules or anything you want about Augsburg 1520. All submissions will be reviewed within 24 hours. Click here to add your Augsburg 1520 comments.